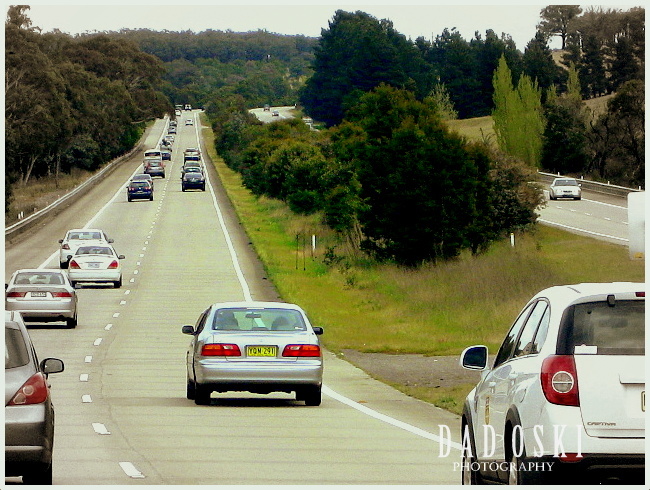 On the road to Canberra. We knew that Canberra in the Australian Capital Territory is the seat of the government of Australia. We knew too, that Canberra is the site of Parliament House, the High Court and numerous government departments and agencies, the location of many social and cultural institutions of national significance, such as the Australian War Memorial, Australian National University, Australian Institute of Sport, National Gallery, National Museum and the National Library. They say that the Australian Army’s officer corps are trained at the Royal Military College, Duntroon and the Australian Defence Force Academy is also located in the capital. Heaps of attractions indeed! These importance and great icons of Canberra to Australia spurs our group with interest to visit and set up a serious date. So, two years ago during the Floriade we started our three day journey and because it was a peak period, we also planned to camp outside of Canberra, at a place bordering with New South Wales. Our first stop on our way to Canberra was at Mittagong in New South Wales. 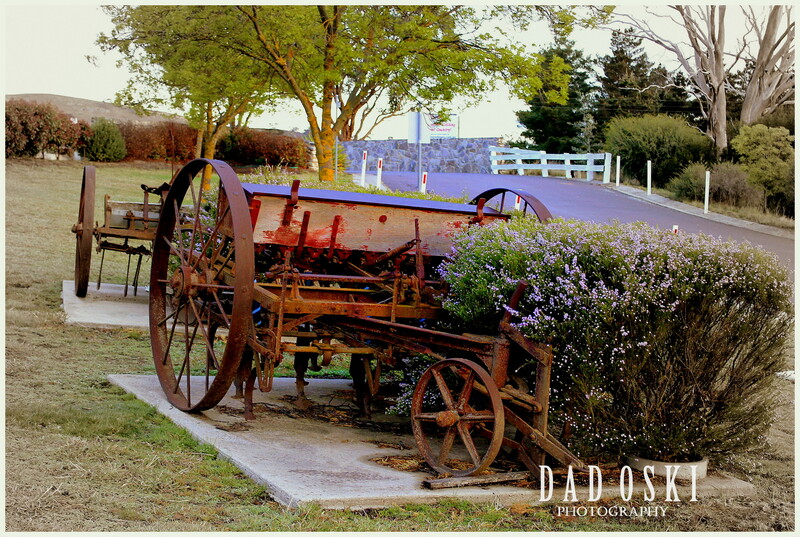 Mittagong is a town located in the Southern Highlands of New South Wales, in Wingecarribee Shire and is the home to many wineries of the Southern Highlands which has been a recent growing wine and cellar door region. We bought snacks at the MCDonald’s here and drove on to a nearby park called Lake Alexandria to consume them. They say that this was a man-made lake which started life as a dam supplying water for engines hauling coal to the Fitzroy iron mines almost 140 years ago. A park land reserve surrounds the lake and birdlife lives in profusion on the water and shores. Barbecue facilities and shelter sheds are available. The whole area has recently been revamped and renovated. 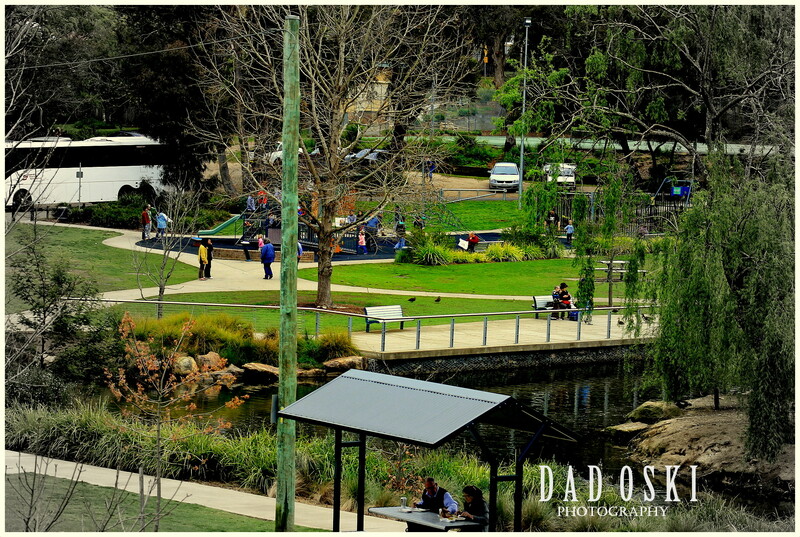 Though we had a brief stopover here, everybody seemed to have enjoyed the beauty of the place especially the newly renovated lake, amused by the heaps of different coloured or species of ducks swimming, the jettisoning water fountain at the middle, and a walkthrough the cemented pathway around the lake. Nearby, is the Lake George Winery one of the winery and cellars in the area and we alighted here too. But because our group considered their wines a bit expensive, we didn’t stay long enough. Finally, we arrived at the Capital Country Holiday Village where we camped for the three day escapade. Capital Country Holiday Village (Formerly White Ibis Holiday Village) is 14km north of Canberra. Some facilities in the park are good; they have swimming pool, basketball court, volley ball, tennis, jumping pillow, putt-putt, kitchen, toilet/bath, and a function room. But the kids just loved the jumping pillow, and a bit of the putt-putt. We didn’t use the swimming pool because it was too chilly at that time, and a bit small in size compared to the swimming pools of Melaleuca in Port Macquarie, and in Milton Tourist Park. Weather wasn’t good enough during that time, it was very chilly, windy even, and it rained too. Others have to sleep inside their cars because it was too cold especially at dawn. The main attraction of the park was its man-made lake that added beauty to it with some ducks swimming, too. Also, there were some kangaroos that always wanted to get closer to the campsite in search for food. But they run instantly away once they felt you getting closer to them. I really am pleased with the location of the park, very country, and a very relaxing environment indeed. On the night of October 01, we drove down to Canberra and had a nice view of the entire Canberra and its surroundings, Canberra by night! The following day, we visited the Parliament House. 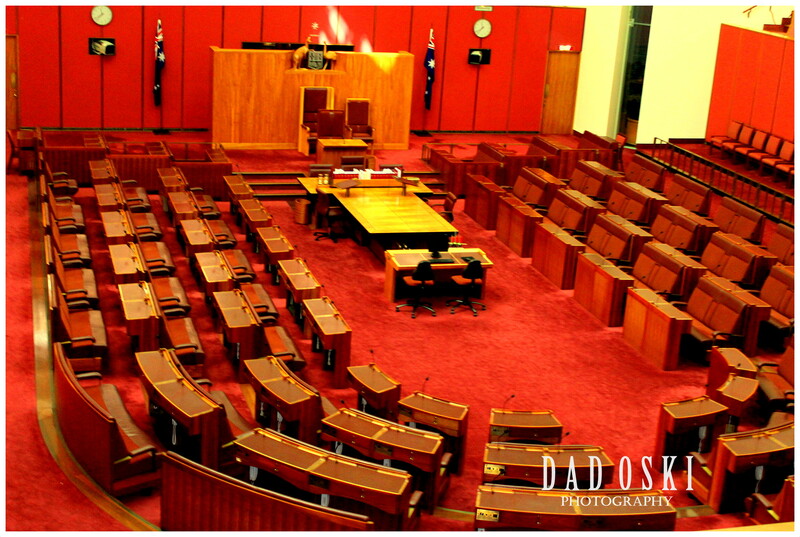 Parliament House is the meeting facility of the Parliament of Australia located in Canberra, the capital of Australia. History recorded that the building was designed by Mitchell/Giurgola Architects and opened on 9 May 1988 by Elizabeth II, Queen of Australia. It has a formidable 4,700 rooms and many areas are open to the public. The main foyer contains a marble staircase and leads to the Great Hall which has a large tapestry on display. The House of Representatives chamber is decorated green while the Senate chamber has a red colour scheme. Between the two chambers is the Members’ Hall which has a water feature and is not open to the public. The Ministerial Wing houses the office of the Prime Minister and other Ministers. The Parliament House has become a top tourist spot in the city. At the entry point, we were searched out for any metallic items for security reasons and must be taken off from our body and everyone has to pass by a metal detector to get through. Guards were all over the place, even on roof tops in addition to cameras. A wide parking space is provided at the basement of the building. I had heaps of photos taken here from outside as well as inside the building. Next, we visited the Australian War Memorial. The Australian War Memorial is Australia’s national memorial to the members of all its armed forces and supporting organisations who have died or participated in the wars of the Commonwealth of Australia. The memorial includes an extensive national military museum. The Australian War Memorial was opened in 1941, and is widely regarded as one of the most significant memorials of its type in the world. It is the northern terminus of the city’s ceremonial land axis, which stretches from Parliament House on Capital Hill along a line passing through the summit of the cone-shaped Mount Ainslie to the northeast. No continuous roadway links the two points, but there is a clear line of sight from the front balcony of Parliament House to the War Memorial and from the front steps of the War Memorial back to Parliament House. 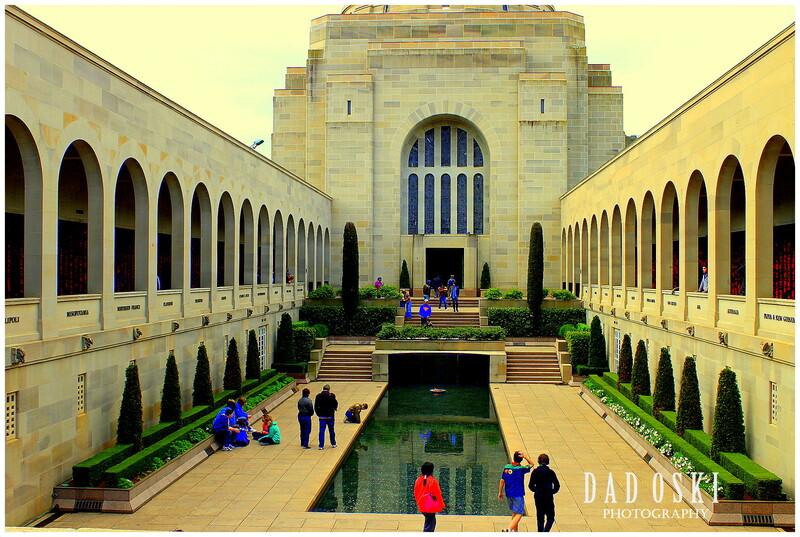 The Australian War Memorial consists of three parts: the Commemorative Area (shrine) including the Hall of Memory with the Tomb of the Unknown Australian Soldier, the Memorial’s galleries (museum) and Research Centre (records). The Memorial also has an outdoor Sculpture Garden. This is another icon for the city, a tourist attraction for tourists both for local and foreign. There were a lot of rooms, heaps of items to cover, and it will probably take about a day to review them all. I just can’t believe that many people have the intense interest of looking at these pieces of history to the point that they obstruct other visitors to get in and out of memorial doors. Well, as I go deeper into the many pieces of war machines and memorabilia, I came to wonder with amazement how they gather and piece them all up to create a memorial as huge as this! It rained when we had our final hour at the War memorial, and also when we arrived at the camp site. We had a hard time cooking our foods; some guys had to go to the kitchen, because it was too cold outside. October 03 was our final and check out day at the camp, and the last day for the holiday. 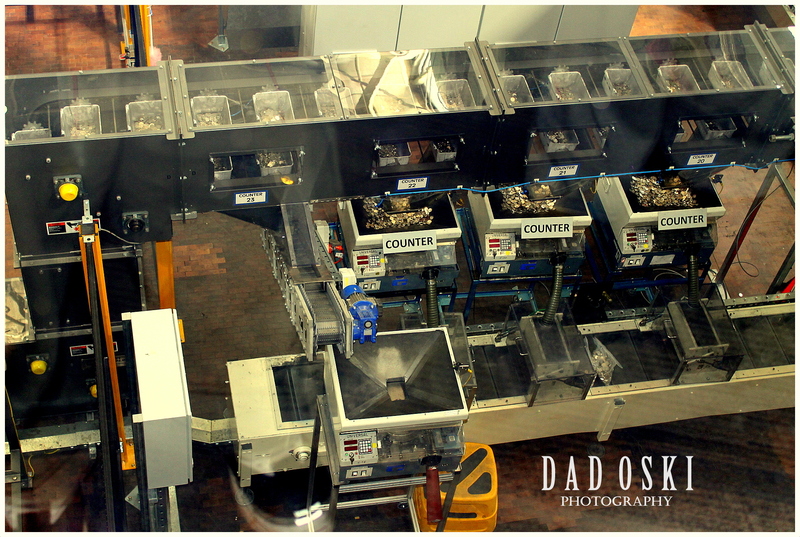 We continued our trip and landed at the Australian Mint. The Royal Australian Mint is a prescribed agency within the portfolio of the Department of the Treasury, with responsibility for producing circulating and numismatic coin for Australia. As well as being the sole producer of Australia’s circulating coin, the Mint has struck coins for a number of South Pacific nations; produces a range of collector coin products in precious metal and base metal, for sale in Australian and overseas markets; and manufactures medals, medallions, seals and tokens for private and public sectors and sporting and tourism groups, both nationally and internationally. The Mint is also a major tourist attraction in Canberra. There were heaps to enjoy here too, including that robotic arm, and the remote controlled fork lift at the manufacturing floor. Some items were documented and captioned that it takes some time to read them all. We stayed for a couple of hours here after that we moved on to the Floriade. Floriade – Tulips everywhere at the festival. Floriade is Australia’s celebration of spring, featuring more than a million blooms as a backdrop, Commonwealth Park in Canberra explodes into colourful bloom with fantastic entertainment, displays and a whole program celebrating a set theme each year. That is how they define Canberra’s Floriade, and so we’re here to experience it, too. But the city had a chaotic traffic, and not enough car parks nearby, and so we got a hard time looking where to park our cars. We spent a quarter of an hour looking for such a place. We found one, but we still had to walk a distance to reach the Floriade site. 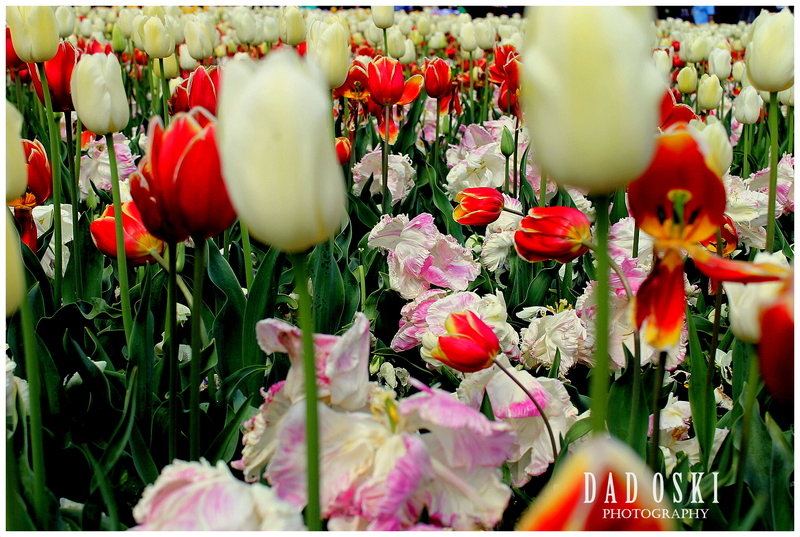 Floriade … it’s all about flowers, and most of them were tulips, tulips everywhere, beautiful flowers all over the place! Mad place to go, really good for flower enthusiasts! There were exhibitions and displays to inspire a taste of fresh and healthy living, spring sensations including fashion displays, floral art, crafts and fine art, horticultural displays and practical tips and advice on home gardening and outdoor living from noted celebrities and experts and a dazzling entertainment including music concert when we were there. I am sure that there were huge preparations and patience, work and teams involved for this festival, an awesome spring celebration indeed. 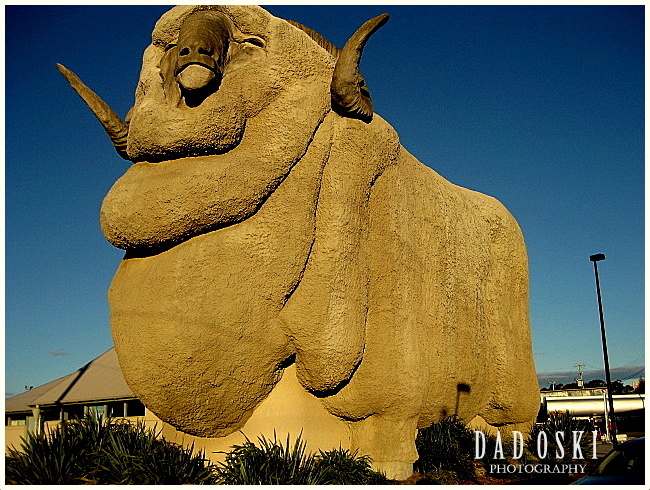 The huge Ram (Merino) statue. On our way home, we had a brief stopover at the big Ram in Goulbourn, New South Wales. We were amused at the huge statue of a ram, and for sure this became a landmark for the township. We had several photos taken here, making the big Ram as our background. 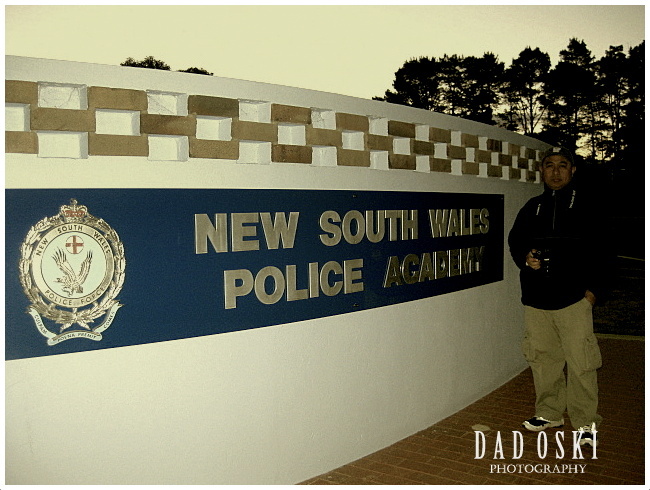 We also ventured to visit the Police Academy of New South Wales, but we haven’t got any time longer to stay for a while, just a short photo taking inside the academy and at the entrance. On our way home at around seven in the evening, we drop by the Mc Donald’s here to have our dinner and at the same time to stretch out. Well, this journey had enriched our knowledge of our surroundings, the history, the beautiful landscapes we drove in and out, an experience we wouldn’t forget at the camp site and many more. Above all, we enjoyed of course, and to some in the group wished to come and visit Canberra again.